Already registered? Bookmark this page for everything you need to help you get booked on set. Check our Jobs page for all the latest roles we are casting. You may also receive a text message* from Casting Directors checking your availability. Call the number given or send an email to the address provided on the job posting. The Casting Director will give you your booking information. Be sure to write this information down. You will receive a call time, category, and a show name with a passcode to access your details at the link below. Still have not been booked? If you have not been booked by 7pm and are completely available without restrictions for the next day, you can add yourself to the After Hours Availability List for a chance to be booked on replacements and rush calls. Apr 19: Our offices will be closed for registration on Friday, April 19. We will resume normal registration hours on Monday, April 22. We are excited to announce our new online registration process in all offices! To register, just fill out your information on our website, then make a reservation to visit your local office to complete paperwork and take your casting photo. To read the full instructions and begin the online registration process, visit our Register page. Are you getting our texts? Are you a T-Mobile customer? T-Mobile has released a feature that allows their customers to “opt-out” of business messages. In order to receive text messages from Central Casting, T-Mobile users will need to contact T-Mobile support at 1-800-866-2453 and ask for this feature to be turned off. Once the opt-out is removed, you will be able to receive messages from Central Casting. Even if you are a T-Mobile customer who has received text messages from Central Casting in the past, please check with T-Mobile to ensure you do not have the opt-out feature enabled. Be sure to LIKE our official Facebook page for all the latest news, events, photos, and videos – Straight Out of Central Casting! Brand new articles are available now. Each article has a quick poll. Be sure to cast your votes. Keep checking back as we continue to post regular new content. Regularly check this calendar for the Central Casting New York office. You must have an appointment and photo ID to visit our office at 5 Penn Plaza. All adults must complete the online registration process by filling out the online portion of registration and reserving a spot to visit our office during a New Registration Onboarding session. You must bring the required documentation to accompany the I-9 form to your reserved session. Note: the in-office portion of registration can last between 2-3 hours. You must complete registration to be eligible to be cast in our productions. For adults only, minors can register during Minors Registration on Wednesdays at 3:45pm. At this time, there is no online registration for minors. Parents/legal guardians can register their minors by making a reservation and bringing them to our office. Reservations become available exactly 14 days in advance. You can come in during Re-Registration and Updates to add photos and make profile updates. It’s important to keep your file current so Casting Directors know your look and details. Here’s what you need to know about Re-Registration and Updates. SAG-AFTRA members will need to present their current SAG-AFTRA card every time they come to Re-Registration and Updates. You must have a reservation and photo ID to visit our office at 5 Penn Plaza. You will not be admitted through security without a scheduled reservation. Please arrive no earlier than 20 minutes before your session. You will not be admitted if you arrive more than 10 minutes after your scheduled reservation. If all dates are gray then please check back. The date is either currently filled or not yet open. New sessions open up exactly 14 days ahead of time. Spots could also open up at any time based on cancellations. Click here for more info. Once you receive your work details, you’re officially booked. It’s important to write down your work information so you’re prepared when you head to set. Be sure to read our article Casting Director Do’s and Don’ts for Submitting for tips on how to book a job. What do I do if I’m going to be late or need to cancel? Call 646.205.8244 ext. 4. If you cancel, we ask that you give us enough notice to replace you. PLEASE NOTE: You may not cancel via text message. You must call our office. Is there a guarantee of work? No, there is no guarantee of work because the needs of productions change every day. Due to the nature of background work, Central Casting can never offer full-time employment to any of the talent (i.e., you) it employs. What does “checking your avail” and “first avail” mean? This means casting is prepping a scene for a future date and is checking your availability. If you do confirm availability, please mark your calendar to limit conflicts. You become “first avail” (first available) for that show. Typically in these situations, casting will not be able to hire you until the show looks at your picture submission and approves the look. After that, they will usually not release any booking until late afternoon the day before the shoot. If you are offered another booking on the same day, we ask for you to give us the courtesy of the “first right of refusal.” Just let us know so we can inform our show. They may option to offer to hire you first. You are still able to be hired elsewhere if we are unable to confirm a booking for you. How do I get my details? The Casting Director will give you your booking information. Be sure to write this information down. Certain shows or Casting Directors may provide additional information via email or a wardrobe blog. Please review all provided information to ensure you are ready for work when you arrive to set. What happens if I miss a call from Central Casting? Always check your voicemail. Do not call back until you have checked your voicemail to ensure the Casting Director did not leave specific instructions. If no message was left, wait and see if you receive a call back. If you do not receive a call back, assume you are no longer needed. What is a rush call? Rush calls are for immediate same-day work. This is usually to replace a “no show.” When you respond to a rush call, you may be required to get to the set location within an hour or less after being booked. Where can I view the New York Anti-Sexual Harassment in the Workplace Policy? You can view the New York Anti-Sexual Harassment in the Workplace Policy here and the Sexual Harassment Complaint Form here. Can I put my name on an availability list? You can submit to us between 7pm-1am to have your name placed on the After Hours Availability List for when additional roles open up or for replacements made overnight. What’s the SMS messaging feature all about? Casting Directors may choose to reach out to you via SMS messaging. 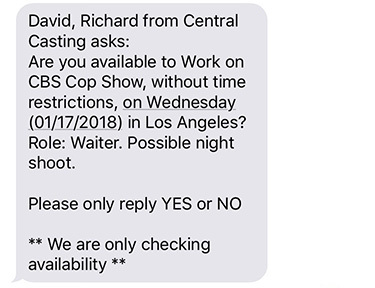 In addition to checking availability, Casting Directors will now be able to send follow up messages, and in some cases, details through text message. How do I know the message came from Central Casting? All messages from Central Casting will be personalized with your name (as it appears in our system), reference the project name, and all replies will appear in the same thread. Why did I receive a text message from Central Casting? What happens after I respond to a text message? Our Casting Directors will review the responses and then reach out to any Background Actor selected to be booked. If you are not selected, you may not hear from anyone. As always, you know you are booked when you receive your details. What does “without time restrictions” mean? When a Casting Director asks if you are available without time restrictions, they want to know if you are available to work the whole day, even if the location or time were to change. For example, if you know you are not available between 1-2pm, you would answer: No. I was on set and didn’t see the message until later, can I still respond? Yes, please respond as soon as you can. Can I respond to multiple requests? Yes, you are responsible for finding work and letting Central Casting know when you are available to work. Casting Directors work independently to meet the needs of their productions, so once you are booked, you are also responsible for not becoming double booked. If I receive multiple requests, should I reply to all of them? Yes, please respond to each request you receive. If a Casting Director books you for a specific role, it is your responsibility to decline any other offers to ensure you’re not double booked for the same day. Did you get my response? If you didn’t receive a confirmation response, please send your response again. Please note: the system is engineered to only accept a YES or NO response. If you don’t hear back from a Casting Director with booking details, you are not booked. However, given the volume of roles they are booking, please be patient as it may take them some time to respond. Can I change my response? Yes, simply reply to the original message with either a Yes or No response. If you receive multiple messages in the course of a conversation with a Casting Director, you will only be able to change your response to the most recent message. Please note: after you have received your details and are booked, you must follow the appropriate procedure if you need to cancel. You cannot cancel via text message. What are the role details? Role details may or may not be communicated via SMS text message depending on the production. If you are booked, you will be notified where you should go to learn your full booking, wardrobe, and location instructions. These instructions might include an info tape, email, and/or wardrobe blog. Do I still have to call the Info Tape and Call Time Change Box? Yes. Though your details may be provided to you via SMS text message, your full booking, wardrobe, and location instructions may still be available as part of an info tape, wardrobe blog, or email from the Casting Director. Please review all materials to ensure that you understand what will be expected of you when you arrive to set. If I receive a text message, does that mean I’m booked? You are not booked unless you accept an offer for work and receive details. What if I respond to a text message and never hear back? Thank you for your response. Sending a “Yes” response tells the Casting Directors that you are interested and available to work, but does not guarantee that you will be booked. Depending on the casting volume, you may not hear back. What if I don’t get a confirmation message? Please send your response again. What number will Central Casting text me from? Central Casting will use a variety of numbers to reach you. Once you receive a message from a Casting Director about a specific project, all follow up questions and replies will appear in the same thread. Can I call the number I received a text from? Unfortunately, our texting numbers are only formatted to send outbound text messages and receive a Yes or No response. Can I respond with something other than Yes or No? In order for our system to read your response and provide it to the Casting Directors, we need to limit the text to only Yes or No. What if I am only available part of the day? Casting Directors sometimes don’t receive call times until the last minute, so we are asking you if you are available for the full day. If you are only available for part of the day, please reply No. Why was there a link in my text message? Some Casting Directors and productions may provide additional instructions with a wardrobe blog or similar resource. Please review any materials provided to ensure that you will be ready for work. There’s a link in my text message that doesn’t work. What do I do? If for whatever reason a URL isn’t working, write down the URL and attempt to enter it directly into a web browser. Why was my message split? Not all carriers and phone service providers handle SMS messages in the same way. Some carriers, like Sprint for example, may split long messages. Unfortunately, when this happens, there is no guarantee the split message will arrive in a predictable order. Can I get text messages in a language other than English? No, the messages are only in English. I’m not getting text messages. Does T-Mobile’s business message “opt-out” feature prevent me from receiving text messages from Central Casting? Yes. T-Mobile has released a feature that allows their customers to “opt-out” of business messages. In order to receive text messages from Central Casting, T-Mobile users will need to contact T-Mobile support at 1-800-866-2453 and ask for this feature to be turned off. Once the opt-out is removed, you will be able to receive messages from Central Casting. Even if you are a T-Mobile customer who has received text messages from Central Casting in the past, please check with T-Mobile to ensure you do not have the opt-out feature enabled. I’m not registered with Central Casting. Why am I getting these texts? We are sorry for the inconvenience. Most likely your mobile number was previously owned by someone registered with us, or provided to us inadvertently. Can I opt out of SMS messaging? As an employee of Central Casting you provided your mobile number to us so that we can contact you about jobs for which you would be a potential match. However, if you no longer want us to reach out to you via text message, please call Central Casting and request that your number no longer be used for text messaging. Once you have booked a job, you are ready to get on set! It’s important to show up on time and camera ready. When you arrive, check in with your contact and get your voucher. Your time on set will vary, but a typical day lasts up to 12 hours. You are an important part of the production, please be professional and have a good attitude on set. What if I forget or lose my work information? It is critical that you write down your work information. If you lose your information or if you have any questions regarding your work information call 646.205.8244 ext. 4. How will I know if my call time changes? When you get booked for your job, ask the Casting Director how to get your call time changes. It is your responsibility to get call time changes for each booking. What do I need to bring to set? Come to set camera ready. Bring your ID and any additional wardrobe or props requested by production. Who do I report to on set? Roles change from set to set, but often a Background Actor’s main contact is the 2nd Assistant Director (2nd AD) and Production Assistants (PAs). What do I do when I’m not filming on set? When you are not required on set, you will be taken to a holding area. You can bring items to the holding area to keep busy while you are not working. Can I bring a guest to set? Do not bring guests to the set with you. What happens if I get hurt on set? If you are injured on set, you must report it to the Assistant Director and/or medic immediately. Central Casting handles both casting and payroll services. When you register with Central Casting, we become your employer and, in most cases, are responsible for paying you. How soon after I work can I expect my paycheck? Checks are due to be mailed on the Thursday after the week you worked. They may be mailed out earlier depending on when the production company turns in the complete and accurate vouchers. Can I pick up my paycheck? No. At this time, we do not have the resources for checks to be picked up. Paychecks are handled in a security area with 24-hour surveillance and delivered by our bonded driver to the post office directly. Paymasters do not have access to your paychecks. How long does it take for me to receive my check after it’s mailed? The checks are sent first class mail. While you will receive most checks within 2-3 business days after they are mailed, there are times when it could take longer through the federal mail system, particularly during holiday periods. Why do I sometimes receive my paychecks out of work date order? Checks are not mailed out in order of work date. Before we can cut a check, the production reviews and completes the voucher, and production companies vary on how often they process and send in the vouchers. Why don’t my paychecks match the exemptions on my voucher? We often process vouchers for more than one work date at the same time. The system will calculate all paychecks processed on any given day with the same number of exemptions from the voucher that was last input into the system. If you vary the number of exemptions you are claiming daily, we cannot guarantee that any particular voucher will match your paychecks. The box for number of dependents should reflect the amount of exemptions you are able to claim. Do I need to write my Social Security number on my voucher each time I work? Yes, there are many people we payroll with the same or similar names. You will need to put your Social Security number on each voucher so we can correctly identify who we should pay. Your voucher will either be delayed or not processed if we are unable to identify who worked. What is the best way to contact the payroll department? For payroll inquiries, please call 800.562.2718. Representatives are available Monday-Friday, 8am-5pm PT. How do I change my address with payroll? You may change it on your voucher when you work or you can fill out our address change form. You must update your address with both payroll and casting, as we store information separately. How do I place a stop payment on a paycheck I never received? You can either fax or mail us your stop payment request. You will need to specify in writing that you are requesting a stop payment and include your name, Social Security number, address and signature, along with the work date and show name for the check you are missing. If the net of the check is over $150, you will need to sign a bank form supplied by our department and have your signature notarized before we can place a stop payment. For your convenience, we have a notary available free of charge by reservation only. You can set up a reservation by calling 800.562.2718 between 8am-5pm. How long does it take to reissue a check after I request a stop payment? Five business days for current year checks, longer if the check was cut in a prior year. We are unable to reissue a check that has been stop paid until after we have received confirmation from the bank that the stop payment was successful. How do I request a work history? Call 818.955.6313 or send your request in writing to our payroll department either by fax or through the mail. Be sure to include your name, Social Security number, address, and the year(s) you worked. You will also need to state whether the request is for your own personal records or to enable you to join SAG-AFTRA. SAG-AFTRA will only accept faxes sent directly from our payroll department certified by our manager. How do I get my W-2? To access your W-2, visit EP’s W-2 page. How can I submit an inquiry or correction to my tax form? To submit an inquiry or correction to your form, please fill out and sign our inquires and corrections form. How can I verify my employment with Central Casting? For employment verification, call 818.955.6313. This is an Entertainment Partners line; they will be able to provide employment verification. You must bring photo identification to show security when you arrive for your scheduled reservation time. If you are updating your file, you must bring the required documentation to accompany the I-9 form. More details can be found on our Register page. SAG-AFTRA members will need to present their current SAG-AFTRA card every time they come to Re-Registration and Updates. SAG-AFTRA members should always bring their current SAG-AFTRA card when they visit our office. Can I take a new photo? A digital photo of you will be taken in our office when you come in for Updates. What are some examples of additional photos? Unique or rare vehicles or motorcycles that you own. How do I change my status from Non-Union to SAG-AFTRA? You can change your status during Updates. You must present your identification along with your current SAG-AFTRA card fill out a data change form. How do I change my file information? If you would like to update or change any information you can do so during Updates.